Ground Penetrating Radar Systems, LLC. has a few different tools that could be used to locate, potentially anything, within a concrete slab. GPRS used The 1600MHz antenna on this project; the 1600 is our standard piece of equipment. We also used a smaller antenna called “The Palm”, this antenna Is a 200MHz antenna and it helps us get into smaller areas and allows us to get to areas that are just too tight for the larger 1600MHz antenna. Finally, GPRS always has a Radio Detection wand handy for all jobs. The Radio Detection wand is a way to double check that there is no power running through the slab. In the image on the left you can see Cooper, one of our team members in the South Florida using the 1600MHz antenna. 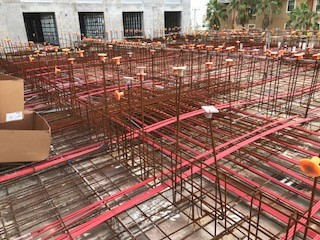 At this parking garage, we were able to locate all the reinforcement within the slab so that they could core drill safely. The contractors where glad that they did not have to clear out the area, like they would have to had done if they used x-ray. This job site did not have the option of being cleared out, but wanted to make sure that the work was done safe as well. GPRS was able to ensure that both were done. Radar is safe to be around, and the job was done without the core driller hitting anything within the slab. At GPRS we make our marks however our customer wants. At this site the contractor wanted our marks in permanant marker as you can see below. 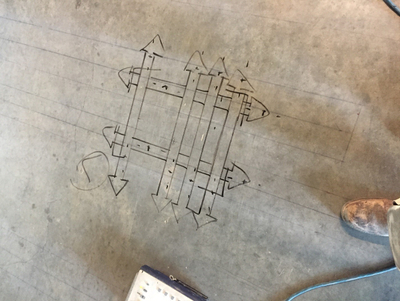 At GPRS, as well as many other great things we are know for our clear marks, so that a core driller can get in and out without hitting anything within the slab. 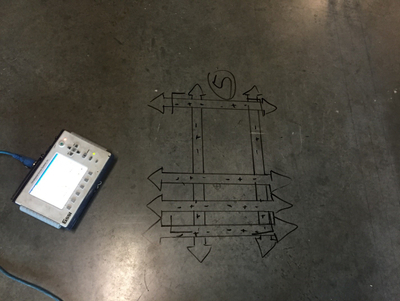 GPRS does much more than concrete scanning. 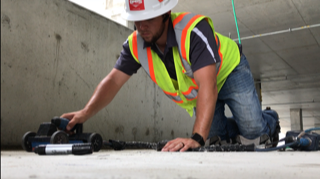 We also do utility locating, underground storage tank (UST) locating, and we can even find voids. If you need work done safe, it is our job to make sure you don’t hit anything while drilling, cutting or digging. If you need work done in South Florida please contact Cooper Cox, Project Manager, at (561) 322-6469 or cooper.cox@gp-radar.com.